Epping Wedding Car Hire – Classic Cars for Jessica and Tony! 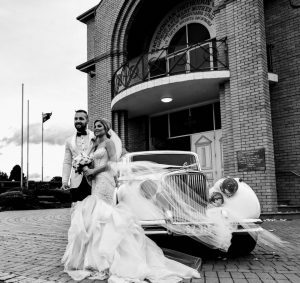 Epping Wedding Car Hire – Classic Cars for Jessica and Tony’s Classic Wedding! For Jessica and Tony, their wedding oozed classic style. So their Epping wedding car hire needed to be classic too! A perfect wedding is all in the details. Just like Tony, we were captivated by the beautiful bride in her amazing gown. Jessica shone on her special day, so much so that you can even see her glow in black and white photos. And they had the perfect Epping wedding car hire to match. The beading detail in her dress added to the romantic atmosphere – reflective of bygone eras, Hollywood glamour and pretty, feminine couture. It was strikingly complimented by Tony, in black and white. Tony himself looked like he just stepped out of a 1950s movie set! Therefore the Jaguar MK-V was the best choice for their Epping wedding car hire. It perched patiently outside the St George Macedonian Church in Epping, after delivering the happy bride to her ceremony, and waited for the amazing photo opportunities afterwards. We’re sure you’ll agree that the photos are stunning! Jessica and Tony look blissfully happy, and ready to start a new chapter in their lives as husband and wife. The team at JC Jags congratulates them and wishes them all the best for a bright and abundant future. 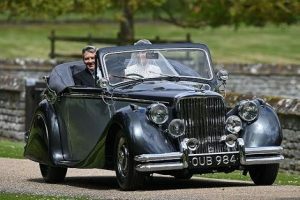 For their Epping wedding car hire, Jessica and Tony chose the Jaguar MK-V model – just like the equally beautiful Pippa Middleton, who recently married her own Prince Charming. It goes to show that a classic Jaguar really is the car to arrive in on your big day! A popular choice for many couples on their wedding day, the 1950 Jaguar MK-V was considered one of the finest of its class in the world. It blends vintage style with newer conveniences and luxuries, making it a brilliant car for any discerning bridal party. With elegant, flowing lines and classical upholstery, the Jaguar MK-V can transport up to four passengers. Deep seats, plenty of leg room, and enough space for even the biggest of bridal gowns! On your special day, you’ll enjoy your fully chauffeured journey in a fully restored, luxurious and classic Jaguar. With leather upholstery, white exterior, polished walnut dashboard, white wall tyres and a sunroof, you’ll be riding in style. This stunning model Jaguar MK-V is perfect for all your Epping wedding car hire needs. Contact JC Jags today and find out how you can arrive in style and transport your day into a whole new level of class!